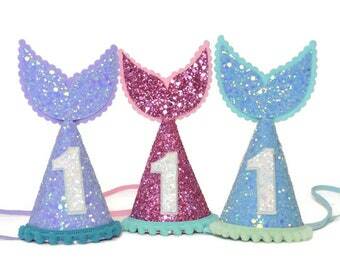 Available in AQUA, LIGHT PURPLE, METALLIC PINK. Please select your color at checkout. 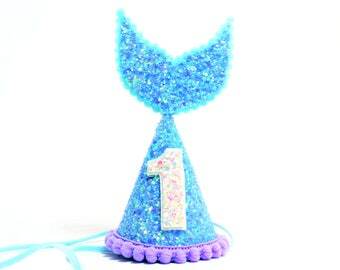 ONE Mermaid Tail glitter party hat, features tail that is permanently glued on that is bendable, with or without WHITE number. You can choose to add any number/size using the drop down menu. 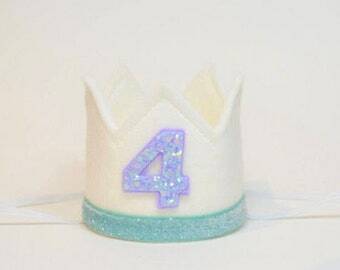 **If there is no note for trim color, I will send the one shown in the color hat you choose. 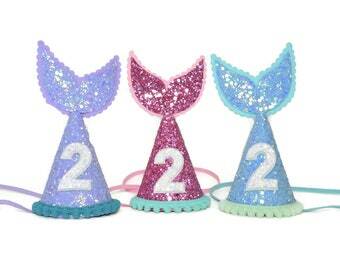 Available in aqua, light purple, or metallic pink. Please select your color at checkout. 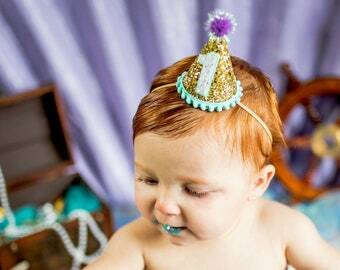 Our party hat headbands are attached to a comfortable skinny elastic and meant to be worn around the back of the head, behind the ears. (Not under the chin). 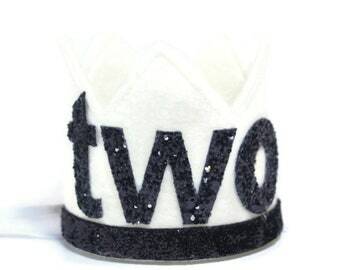 Hat measures 3" from bottom to top of pom, and 2.25" in diameter and will sit on top of head as shown in the photos. Tilt to the side for a fun, whimsical look! 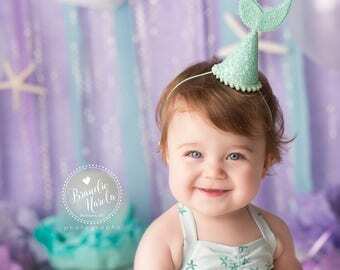 LITTLE BLUE OLIVE CROWNS and HATS are the perfect accessory for birthday celebrations, memorable photo shoots and every day fun for dress up. Hats are hand crafted of a high quality, non-shed glitter made imported from Europe. We are the "original" crown headband designers since 2012 and very proud of our designs and reputation. We know you will be very satisfied with your purchase! 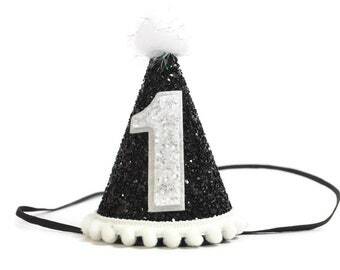 To customize your own mini party hat! Rainbow balloon coordinates well with this hat! Want a hard head band shop the link below! 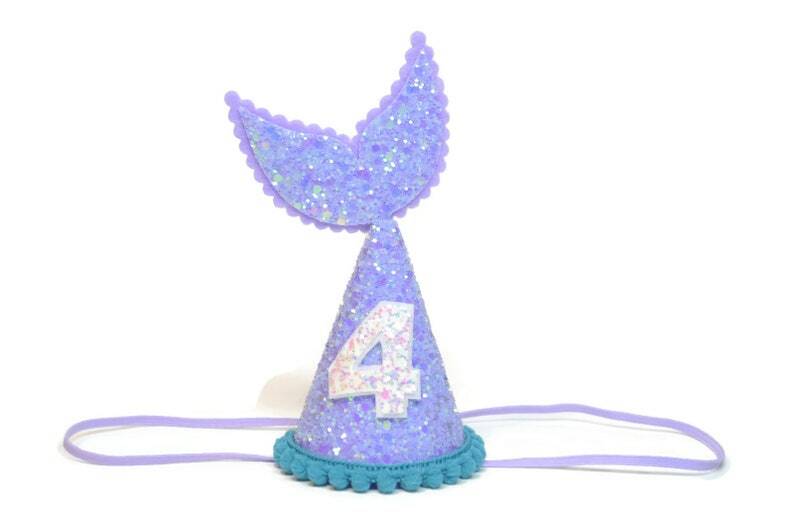 Bought this for my daughters first birthday and loved it so much that I bought it again for her second birthday! It’s so cute! Hope to keep it a tradition now!